Eastern skunk cabbage (Symplocarpus foetidus), in the Araceae (Arum) family, is the first plant to emerge in spring, often melting the surrounding ice and snow. Its flowers have the remarkable capacity to produce metabolic heat on average 20 degrees Celsius above ambient temperature, day or night, over a 12-14 day period. It is a member of a very small group, principally in the Arum family, called "thermogenic" plants which include konjac, dead-horse arum, and titan arum, the world's largest unbranched flower head. "Heat is generated in the mitochondria, as a secondary process of cellular respiration called thermogenesis." During this time the plant acts as though it were a warm blooded animal. 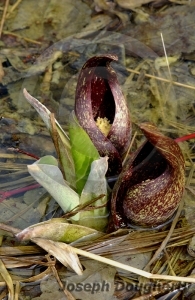 The emerging sculpted bog life consists of a 4-6 inch high hood-like spathe (bract), in a variety of colors, enclosing a knob-like spadix (fleshy spike) covered with tiny flowers. Common colors of the spathe are maroon, wine-red, brownish-purple, or mottled with stripes of yellow. The spathe surrounds and protects the flowers of the spadix. It does not unfold. In common with wake-robin (Trillium erectum), and pawpaw (Asimina triloba), skunk cabbage flowers emit a skunk-like, fetid, offensive, malodorous odor. Pollination is by the few small flies and beetles that are attracted to the smell of decomposing flesh or carrion. The cabbage part of the name, skunk cabbage, is paramount during the warm days of late April when a large spear-like bud, adjacent to the spathe, unfolds rapidly giving way to bright green leaves. Gradually a large funnel-shaped rosette of 3-4 foot oblong leaves form. By mid-May growth is at a climax and islands of green skunk cabbage appear in the wetland. Skunk cabbage may be considered a "succulent" plant in the context of being a plant of marshy ground. However, a thick waxy cuticle is missing, allowing the leaves to act as a conduit for water evaporation even increasing the humidity over the wetland. Neither the leaf stalk nor the leaves develop any woody fiber. Moreover, both the spathe and the flower are watery and spongy. By the end of July or early August the skunk cabbage has disappeared; it has dissolved back into the landscape, leaving only a few leaf stalk remnants. It unfolds rapidly and disappears rapidly. Beneath the ground, a full-grown plant has a massive root system, impossible to dig up. A few inches into the mucky soil is found a thick roundish stem or "rhizome" from which the leaves grow. 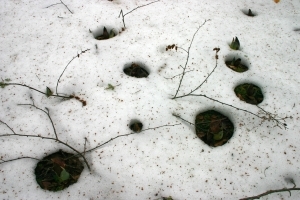 The roots are arranged in a ring-like pattern. The roots grow and then contract, pulling and anchoring the plant deeper into the earth each year. Skunk cabbage does not propagate vegetatively--no spreading from the rhizome--but by pea-sized seeds. After pollination the fruits begin to grow. By mid-June the fruit heads are roundish balls, about 2 inches in diameter. They usually have the deep wine-red color of the spathe. The fruit head has many berry-like fruit compartments, each containing one seed. In August, the fruit head falls apart: to be eaten, to decompose, or to germinate. The following two plants in the Arum family are food plants the world over: Monstera deliciosa, is a New World tropical plant where the spadix (flower spike) is the edible fruit. Taro (name of Tahitian origin), is a staple crop in areas near the equator. The edible corm is consumed but also eaten as a leafy vegetable.